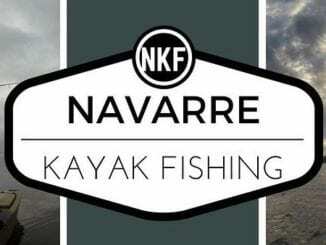 Are you interested in booking a Kayak Fishing Adventures? If so, this article will help you understand exactly what you’re getting into! During the summer, the kayaks are in the water before the sun crest the horizon and there’s not a soul in sight. Dark, calm, silent, and peaceful start to paint a picture that is hard to imagine and impossible to forget. As the sun peaks over the horizon, baitfish begin skipping across the surface and the flat comes to life. Spring, Summer, and Fall provide the perfect opportunity to throw topwater lures for Speckled Trout and Redfish. Calm mornings provide the perfect environment for throwing topwater lures and the first explosion is sure to increase your heart rate. As the lure walks across the waters surface, bait scatters, the lure disappears, and the drag begins to sing. As the drag ceases, the head shakes begin. A solid fish will make several runs before tiring and sliding into the net. The trips are scheduled for four hours but often run a little longer. Our goal is to ensure the best possible experience and we don’t mind putting in the extra time! After returning to the ramp, we clean and bag the fish so you can enjoy the results of a hard day of fishing. We run Inshore Kayak Fishing Charters year round in Northwest Florida and target a variety of species throughout the year. In the Spring (March – May) we focus our efforts on chasing Bull Redfish in shallow water. Sight fishing these 30″-35″ fish is an incredible experience and is guaranteed to excite. 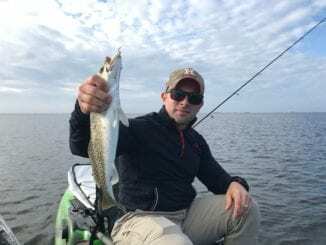 During the Summer (June – September) we start off chasing Speckled Trout using topwater lures and than transition into sight fishing for slot Redfish using soft plastic lures. During the Fall (October – November) focus on completing an Inshore Slam. Speckled Trout, Redfish, and Flounder are the three species we focus on during these months and we catch them in a variety of ways. In the Winter (December – February) we switch gears completely. The cold weather provides us with opportunities to chase giant Speckled Trout and Striped Bass. It’s cold; but if you’re willing to fish, we know where to find them. We run Offshore Kayak Fishing Charters from May to October. Anglers have the opportunity to target a variety of species, to include, Red Snapper, Triggerfish, Mahi-Mahi, King Mackerel, Spanish Mackerel, Cobia, and Sailfish. Offshore trips are easily affected by the weather and safety is our first concern. 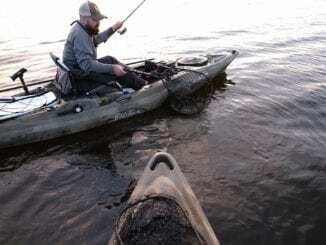 We run all of our Kayak Fishing Adventures using Old Town Predator PDL’s. We use the Old Town’s because they are reliable, stable, and easy to pedal. They allowed us to put well over one hundred anglers on quality fish in the last six months, with ages ranging from 13-85! Every part of kayak fishing is an adventure! Gives us a call at (850)264-3957 and Book Your Adventure. We now offer hotel lodging!! !